Did you know that the Icelanders address everyone, from the president to the local garbage collector, by their first names? Children even call their teachers by their first names, and the Icelanders are listed by their first names in the phone book. The only slight deviation from this is that the head of state [a.k.a. the president] and the head of the national church [the bishop] are sometimes referred to as “herra” [Mr.] or “frú” [Madam] before their – yes – first names. 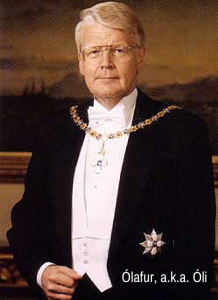 So the president of Iceland today would be referred to as Herra Ólafur Ragnar [NOT Herra Grímsson] and the bishop of Iceland would be Frú Agnes [NOT Frú Sigurðardóttir]. It’s all very egalitarian over here. For more like this, check out this.